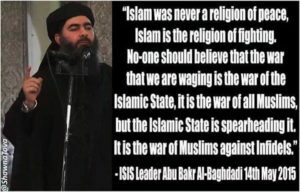 The Islamic State “caliph,” Abu Bakr al-Baghdadi, speaks the truth about Islam. Let’s get to the heart of it: Islam is plain dangerous. It always has been, and it always will be, no matter what flavor it comes in. There’s no need to argue the point because its violence is in the news almost every day, and more people all the time are waking up to the fact that their very civilization is at risk. What needs to be argued is the best way to mount a counteroffensive. Dropping bombs is certainly part of it. Just recently, it was reported that two B-2 bombers flew a 36-hour mission to destroy a secret ISIS camp somewhere in Libya. Result: 100 jihadis killed. That’s great news — except that when the bombers are gone, Islam is still there. 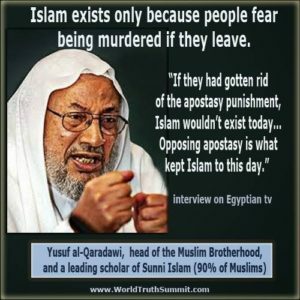 Yusuf al-Qaradawi, head of the Muslim Brotherhood, speaks the truth about Islam. The new approach, the new delivery system, turns what Muslims believe about Muhammad against them. It does so graphically, in movies starring Muhammad — Hollywood quality blockbusters that set off explosions in the mind, the real battlefield. 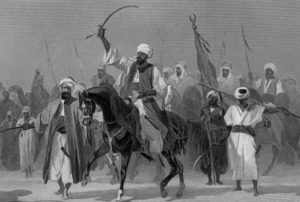 Books have been published that lay out the evidence of Muhammad’s extraordinary appetite for violence, but relatively few people read such books so that their impact is at best trickle down. Yet they lay the groundwork. The authors have done the heavy lifting of tedious research. Their work provides the raw material for the creative imagination to take hold of and transmute into ingenious cinematic productions — not propaganda, but truth propagation films based on what is found in Islam’s own literature. In December, 2016, Dutch school children were made to pray in a mosque. This is happening frequently throughout the West and shows how Islam is infiltrating Western society. This is taking the fight to the enemy. Imagine how these duped people will react when they see their “prophet” recruit hitmen like a Mafia don to kill his critics, mass murder people who refuse to join his religion, enslave men, women, and children, and scream “Kill! Kill!” as he and his followers did when they attacked the caravans, towns, villages, and camps of people who rejected him and his cult. Imagine their shudders when they are shown verses of the Koran where Muhammad boasts of his criminal exploits. Brainwashing works, until it doesn’t. An aggressive and relentless exposure of the de-mythologized Muhammad will cause fractures in the belief system of countless people, and once fracturing begins of a faith based on an absurd myth that hides vile truth, it will continue to fracture until it falls apart entirely. This is already happening to some extent in the Muslim world. Film will accelerate it. As a weapon against Islam, cinema is tactical and strategic, short range and long range, conventional and nuclear. Provided such films are produced aggressively and relentlessly — like the defense industry that churns out warplanes and warships — Islam can be made ultimately to implode. This happened to the Soviet Union in 1989. False ideas eventually fail because they are false. Thus external pressures from aggressive repudiation of the now-informed non-Muslim world combined with the internal depressurization from massive losses to the body of the faithful ultimately will bring about collapse. This can be made to happen. The speed of this implosion depends upon the aggressiveness of the exposure. 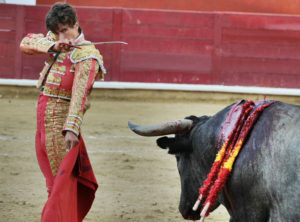 Be like a matador provoking a bull into charging; taunt Islam with its secrets and then move in over the horns for the kill; plunge the cinematic sword into the heart of the beast. It is time to move beyond the fear that Islam inspires. Muslims commit violence against people who mock or criticize Muhammad, and they do so because that is what Muhammad did to people who mocked or criticized him. But the fact that Islam is capable of such things is the reason the exposure must take place. The more provocative the better because whatever the reaction of Muslims to an aggressive counteroffensive through cinema will only draw more attention to what will ultimately bring an end to what they believe. Be like a matador provoking a bull into charging; taunt Islam with its secrets and then move in over the horns for the kill; plunge the cinematic sword into the heart of the beast. As long as these films are solidly grounded in Islam’s core literature, Muslims and their fellow travelers have no defense, and the more they resort to attacking cinematic truth tellers, the more discredited they will become. The Pentagon could justify spending money on such projects under the guise of fighting ISIS and other terror groups by showing the beliefs that drive them. It just so happens that they practice Islam 101, the Islam of Muhammad, so military educational films about these groups (featuring Muhammad, of course) would reveal the essential truth about Islam. Imagine what could be done if the $3 billion spent on the recently commissioned destroyer, the USS Zumwalt, were instead spread out over ten years and spent on truth propagation films for global distribution. 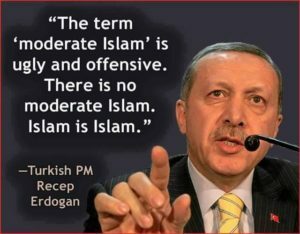 Islam would soon be on the ropes. It is a paltry sum that would do the work of the entire defense budget. Islam is violent because Muhammad was violent. Muslims follow not only his Koran, but also the example of everything he did–his Sunna, which is where the Sunnis take their name. They are the followers of the example of Muhammad, which includes his violence against people who rejected him. There is no end to the cinematic potential of the material. This is unexplored, virgin territory. 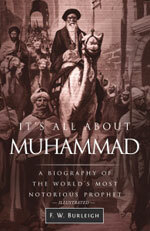 A straight biopic would be great for starters, but Muhammad’s criminal doings can be dealt with from a number of angles. 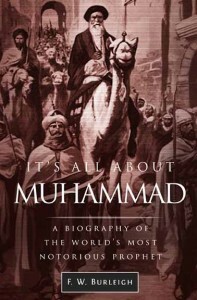 The epilogue of It’s All About Muhammad, A Biography of the World’s Most Notorious Prophet suggests putting Muhammad on trial for crimes against humanity. In this scenario, he is in the docket of the accused along with his lieutenants, as occurred with Saddam Hussein and his henchmen. 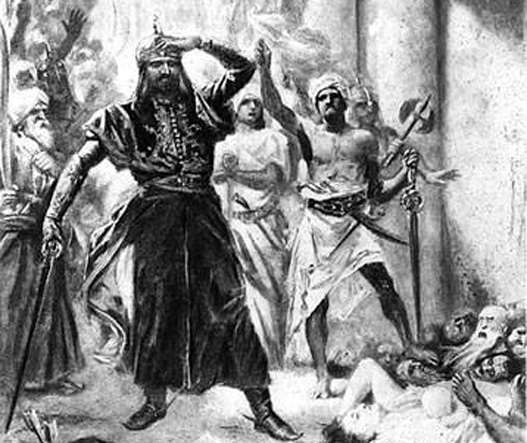 Muhammad’s victims are resurrected to testify about what he did to them. The myth of Muhammad as God’s voice box is thus demolished by the people he murdered, despoiled, or enslaved. The real Muhammad is shown for the psychopath that he was. The canonical material is so vast that it can also be broken down thematically into hundreds of docudramas, one-hour treatments of History Channel quality, all of them starring Muhammad, all of them entertaining and informative. Here’s a possible title for one of these: Was Muhammad a Charlatan, or Did He Really Believe that God Talked to Him? This docudrama would explore the evidence in Islam’s literature that Muhammad suffered from epilepsy, which gave him neurological experiences that led him to believe he communed with the divine. Being a docudrama, it would show Muhammad’s frequent falling to the ground in the manner described in the literature — in one case with froth on his cheeks. Such a production would interview neurologists to give professional opinions about the anecdotal evidence. 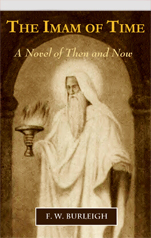 There are so many award-winning possibilities for the creative mind that it boggles the mind: Segments can explore such questions as why Muhammad hated the Jews and what his hatred did to them; Muhammad’s numerous wives and how they got that way; Muhammad’s jealousy that led to the imposition of the veil; the Koran as Muhammad’s blog, and so much more. These docudramas could even take a scholarly turn for the examination of evidence Muhammad plagiarized his prophet stories from Jewish folk tales, refashioning them for his Koran. This is connected to the theme of his hatred for the Jews: The docudrama would show the rabbis laughing in his face for claiming God revealed to him what they knew were inept knockoffs of their prophet folk stories. And it would show Muhammad making them pay for it with their lives. These have the potency of missiles carrying mega-tonnage of explosives. Barrages of them are what will bring about the overdue demise of the myth that is at the very base of Islam, the myth that God talked to Muhammad — and along with it the end of what the myth keeps alive. To send Muhammad to join Zeus and Jupiter, all you need to do is to get the cameras rolling.